Dubai, UAE, September 30, 2018: Stunning paradoxes stemming from progressive complications and disruptive materials. In 2018, the brand that dares to be rare hits new heights of creative transformation with the coming of the fierce dark knight to the hyperwatch segment. Enter the all-black Excalibur Quatuor Carbon, the ultimate paradox between a ‘heavyweight’ movement and a ‘featherlight’ ultra-modern timepiece. 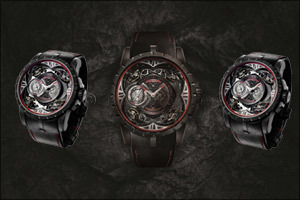 The Roger Dubuis ‘disruptive materials and progressive complications’ ethos has enabled it to acquire an international reputation as an avant-garde Maison perpetually on the look-out for pioneering technical developments and creative aesthetic options – as well as unexpected combinations of the two. Among other world firsts, this incubator of inventiveness and unparalleled technical prowess has given rise to the Quatuor calibre, Roger Dubuis’ revolutionary response to the challenges of gravity. Stemming from seven years of R&D and protected by two patents, the Excalibur Quatuor with its four sprung balances set at 45-degree angles proudly symbolises the mechanical magic of one of the most innovative 21st century Manufactures. Today, Roger Dubuis remains one the only Maisons capable of mastering such a complicated calibre, entirely in keeping with the powerful movements and equally strong aesthetic codes of the Excalibur collection. Since its creation in 2013, the robustly designed Excalibur Quatuor has rocked the watchmaking world in gold, titanium and silicon, while 2017 saw a world premiere version in state-of-the-art CarTech Micro-Melt BioDur CCMTM (® in the USA). Today, the brand that dares to be different catapults innovation to the next level by combining this iconic timepiece with a disruptive multi-layer carbon. Not to mention the fact that its dark good look comes with the added benefit of the bantam-weight nature of carbon which is over 60 per cent lighter than gold. Excalibur Original is the perfect match between high watch-making technology and natural elegance. In this collection, movements are skeleted, giving them a sharp look, and the materials are chosen among the most luxurious and innovative selections. EXCLUSIVE RD101SQ SERIES: A revolutionary approach to compensate the effect of earth’s gravity. The four sprung balances work together and adjust instantly the gravity effects on the movement when the Tourbillon does it in one minute. As of today, Roger Dubuis is still the one of the only maison to be able to master such a complicated calibre.